It's a challenge to pick what's the next fun anniversary treat each month! So many good things to choose from - we want something fun, unique, handy to have. 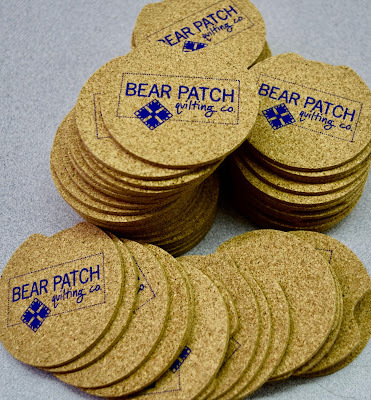 When we saw these little cork coasters, it seemed like a natural choice. Because it's a natural product! It fits in the bottom of the cup holders in your cars, trucks, boats, strollers, RV, and probably even in your private plane! We'll have to try that in our corporate jet. It catches any drips from your cups and bottles. It keeps the cup holder clean, and can be removed easily with a little notched edge. And here's an action shot of my corkie coaster in my cup holder, ready to welcome the bottom of my cup or water bottle on the way to work! 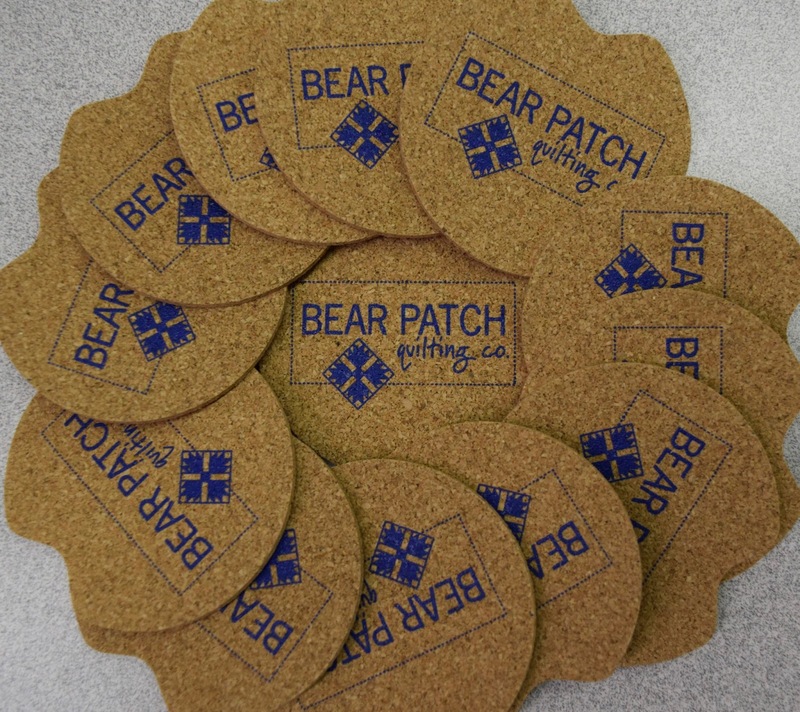 We will be handing our a Bear Patch cork coaster to anyone who comes in the store on Wednesday, September 20. One per person, while supply lasts. We have a plethora of pretty pre-cut prints for Christmas! Now you can benefit from our enthusiasm for ordering beyond our usual supply! We will give you 20% off any of the Halloween or Christmas pre-cut packages -- this includes packs of 2.5" squares, 5" squares, 10" squares, 2.5" strip rolls, and bundles of fat eigths and fat quarters packaged by the manufacturer. 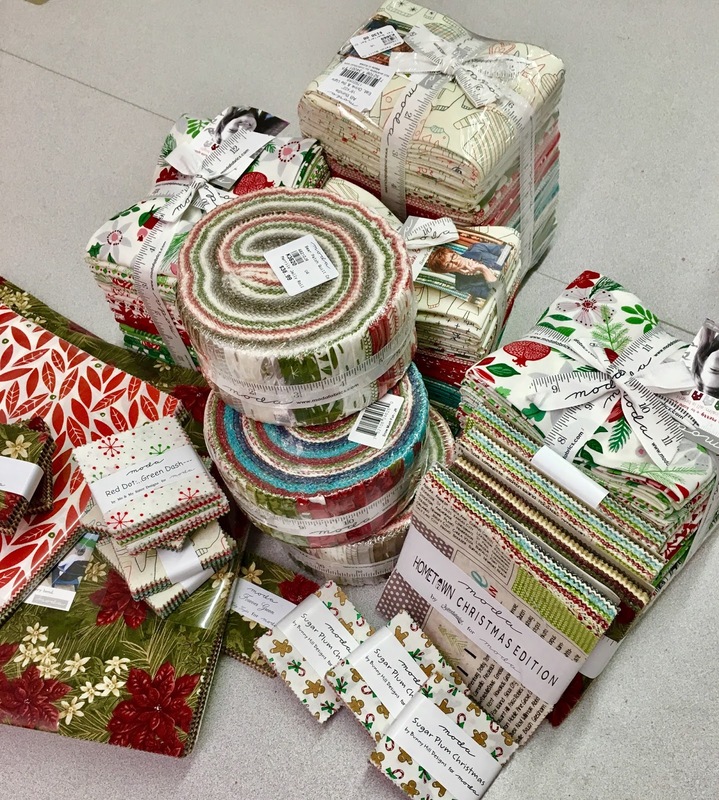 Plus, any of the panel prints from 2017 Christmas fabrics! You probably know a little about pre-cut fabrics, but if you are wondering what all the fuss is about, here's the info: these are die-cut fabric pieces of a line of fabric by a specific designer. They are cut at the factory, wrapped and labeled and shipped. So you get a range of coordinated fabrics to work with in a pack. This is some of our stock, we have more squirreled away in the storeroom. Please note, this is not a sale on fabric yardage. 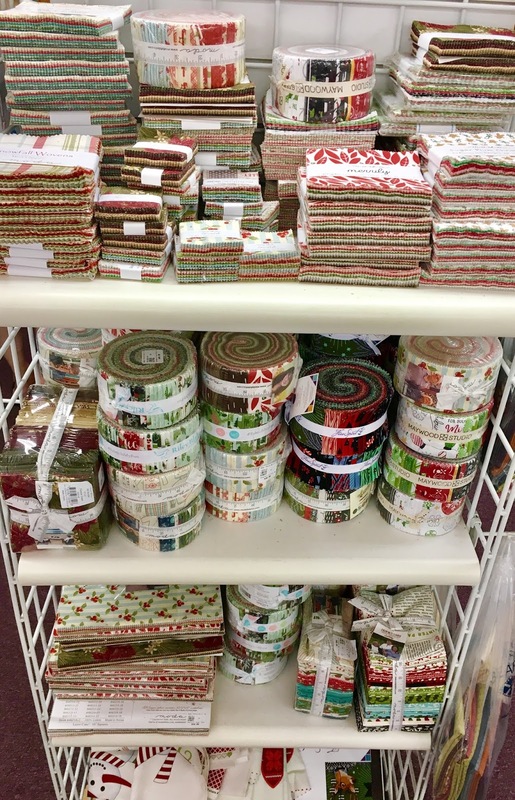 We do have an assortment of books and patterns that are written for these pre-cut sizes, so we can help you find a reason why you must take advantage of this sale! Those little 2.5" squares are like candy to me! Very hard to resist and just as fun. Unless we're talking about M&M's! If you are possibly looking for more inspiration for quilt patterns specific to pre-cuts, then you should hop on over to the website for the Moda Bake Shop. You can even search their files according to the size of the pre-cut pack. So mark your calendars for next Wednesday, September 20, from 9am - 9pm. It's back to school time! And we have some Grade A classes for you! We are always looking for new ideas, techniques, rulers, tools, etc., to add to the curriculum and give you chances to become a better educated quilter! Plus, there are some classes that are all about the fun and social experience of sitting down with friends and soon-to-be-friends! 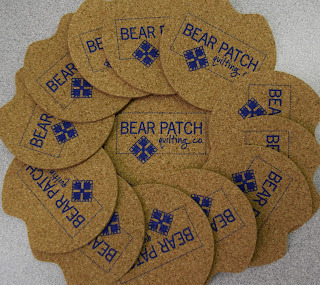 We have watched many people form friendships with the other people they meet through Bear Patch, which makes it much more fun! I have prepared a new slideshow with pictures of some of the class offerings. Please watch it for inspiration and ideas! Then, go to bearpatchquilting.com and read the details for each class under the "Classes" tab. Click on anything that catches your eye to read the full details. Another good way to look for classes is via the "Calendar" tab, which is great if you are looking for something during a particular period of time. Sign-up day is next Saturday, 9/9, which is always like a party at the store! We also have provisions for you to register separately from that day, and it's all explained on the website. Enjoy this tail end of the summer, and join us for a great class (or classes) this fall!